Have Colombia's Rebels Really Given Up on Kidnapping? Ten years ago, Marxist guerrillas in Colombia skyjacked a commuter plane, forced it to land on a rural highway and abducted a Senator who was on board. That audacious kidnapping by the fierce Revolutionary Armed Forces of Colombia, or FARC, persuaded the government to call off peace talks with the insurgents, and the fighting has raged on ever since. But suddenly a new round of negotiations aimed at ending Colombia's 48-year-old civil war seems like a serious possibility after FARC announced on Sunday, Feb. 26, that it would no longer kidnap civilians for ransom  a practice, along with drug trafficking, that has long helped fill the rebels' ample war chest. Given that FARC has abducted thousands of civilians, many of whom were executed or died in captivity, Sunday's news let Colombians collectively exhale. El Tiempo, the nation's most important newspaper, called the move "transcendental." Former presidential candidate Ingrid Betancourt, who was held for six years by FARC before she and 14 other captives, including three U.S. defense contractors, were rescued by the Colombian army in 2008, told Agence France-Presse, "I am hopeful. The announcement signals a change in strategy for the FARC ... It looks like politics is now at the top of their agenda." In a communiqué posted on its website, FARC said that for the guerrillas and Colombian President Juan Manuel Santos  who has made an end to terrorist acts a prerequisite for peace talks  "we believe there should be no more excuses for putting off holding conversations." But some political analysts remain deeply skeptical. According to Colombia police officials, FARC still holds at least 72 civilian hostages. The rebels have said nothing about their fate  and it will be hard to convince the world that they've turned over a new leaf if they say they want to give up kidnapping but nonetheless want to hold on to, if not profit from, the innocents left in their clutches. "The FARC has been abducting people for 30 years and in many cases they didn't even hand back the bodies of [dead hostages]," notes Olga Lucía Gómez, director of the Foundation for a Free Country, an independent group that provides advice to captives' relatives. Moreover, abducting police and army soldiers apparently remains part of the rebel playbook. As a result, Camilo Gómez, who was the main government negotiator during the failed peace talks a decade go, likened the FARC statement to a woman saying she was sort-of pregnant. "You can't go halfway," he says. "Either you stop kidnapping people or you don't." FARC may be moving away from kidnapping not because it is a moral wrong but because it has become a business hassle. In recent years, a massive Colombian army offensive has wrested back territory from the guerrillas, killed off five top FARC leaders and reduced the number of rebel foot soldiers by half, to about 8,000. That makes it far more difficult for the rebels to abduct and hold hostages. What's more, if the weakened FARC wants to break out of its military and political isolation through negotiations, then it first has to wash off the stain of kidnapping civilians, which the international community considers a crime against humanity, says Alfredo Rangel, a Bogotá security analyst. FARC also has myriad other sources of income to keep its war machine grinding on. The guerrillas remain deeply involved in the illegal drug trade  and more recently they've built up a robust extortion racket, blackmailing business owners by forcing them to make payments called vacunas, or vaccinations, because they inoculate the victims from the much worse fate of being abducted. Amid Colombia's oil and mining bonanza, there are lucrative new targets: energy companies in particular complain of constant extortion threats. FARC is also reaping huge sums from small-scale illegal miners who prospect for gold in areas where FARC operates, according to Eduardo Pizarro, who has written several books about FARC. Despite FARC's cynicism, the rebels may find a receptive ear from the government. Though beaten back, the guerrillas have partially recovered from the army offensive and have stepped up their military operations over the past three years. On Monday, for example, FARC rebels assaulted the town of Caloto in the mountainous southern department of Cauca, which has been the scene of constant battles, and set off a bomb in northern Bolívar department. For his part, President Santos has made no secret of his desire to go down in history as Colombia's peacemaker  and he realizes that a final battlefield victory over FARC may be impossible and that the two sides will have to reach some kind of settlement to end the fighting. Still, the rebels refused to make any concessions during the 19992002 peace talks and spent most of that time building up their forces and firepower. That experience turned off many Colombians, who today ask why the country should negotiate with a group that has been blacklisted by the U.S. State Department and the European Union as a terrorist organization. Perhaps that's why Santos was restrained on his Twitter account. 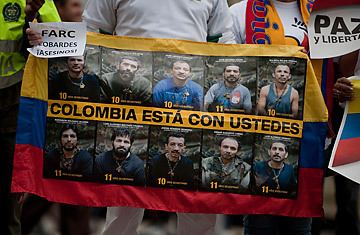 "We value the announcement by the FARC to stop kidnapping as an important and necessary step," Santos tweeted. "But it's not enough."